Omron has been an active innovator in temperature control since introducing its first temperature controller in 1967. Now temperature control has taken a giant leap forward with Omron's next generation of controllers - the E5CC/E5EC, which set new global standards in the crucial areas of precision, user friendliness and control performance. The E5CC/E5EC series will save you time and effort in set-up and operation, while enabling faster and more accurate monitoring/control of your process. The high-visibility display of the new series is also extremely easy to read and virtually eliminates any possibility for human error. The large, high-contrast, white LCD display contributes to the exceptional clarity and therefore readability of the E5CC/E5EC series. The display can be read unambiguously from greater distances and from much wider viewing angles than normal. Coupled with the autotuning algorithms, which greatly reduce set-up and commissioning time, Omron's CX-Thermo support software has been specially developed for use with the E5CC/E5EC series. This enables faster parameter setup, easier device adjustment and simpler maintenance. Although intrinsic high sampling speed and high precision are built into the E5CC/E5EC series, Omron's 2-PID control is a key factor behind the advantage it offers over standard controllers. Using a powerful algorithm, it makes all the difference to control stability and thus the quality of your products. White LCD offers the greatest contrast to the black instrumentation backgrounds found in panels and the lighting conditions found in most control rooms. Despite the compact dimensions of the E5CC/E5EC series, the use of white LCD technology means that the 15-18 mm display height gives maximum clarity for its size. The distance and viewing angle of the high-contrast, white LCD light display is also far less critical for viewers, ensuring correct readings every time. The white LCD display is easy to read in the subdued lighting conditions found in most control rooms. The display remains easy to read even from wide viewing angles. The compact and space-saving design of the new E5CC/E5EC controller generation requires less space behind the panel (60 mm), allowing quick snap-mounting and easy installation even under very cramped conditions. Note:Thanks to the IP66 protection of the front cover, the E5CC/E5EC can withstand humid environments and also be cleaned with non-aggressive fluids. The E5CC/E5EC series is extremely easy to connect, set-up and operate in just a few simple steps using the instrument's five front keys. Omron's CX-Thermo software and new navigation assistant for intuitive settings offers the fastest possible parameter setting, easier device adjustment and simpler maintenance. Key assignment can be changed for RUN/STOP or AT execution/STOP according to user's setting! 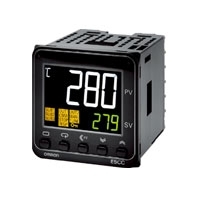 With key features like simplicity in operation, Omron's patented PID control, 50ms sampling period and the ability to handle multiple inputs and outputs, the E5CC/E5EC sets a new standard in fast and precise temperature regulation. It has all the familiar functionality available from existing Omron temperature controllers to cover virtually any general-purpose demand. And naturally, the versatile E5CC/E5EC series is available with input/output combinations to perfectly match all of your requirements. Whether you want to take your existing products into new industrial sectors, or whether you want to expand your business into entirely new geographical markets, Omron can help. We aim to offer the same level of sup port globally, without forgetting local needs. We have production facilities on every continent. Our smart communications network and seamless global support means we can provide you with parts and technical support wherever you sell your machines. And all of our components comply with major international standards, to ensure problem-free integration. It's all there for you.